A classic work of Latin American literature, Domingo Sarmiento’s Facundo has become an integral part of the history, politics, and culture of Latin America since its first publication in 1845. Partially translated into English when it was first published, this foundational text appears here for the first time in its entirety. An educator and writer, Sarmiento was President of Argentina from 1868 to 1874. His Facundo is a study of the Argentine character, a prescription for the modernization of Latin America, and a protest against the tyranny of the government of Juan Manuel de Rosas (1835–1852). The book brings nineteenth-century Latin American history to life even as it raises questions still being debated today—questions regarding the "civilized" city versus the "barbaric" countryside, the treatment of indigenous and African populations, and the classically liberal plan of modernization. Facundo’s celebrated and frequently anthologized portraits of the caudillo Juan Facundo Quiroga and other colorful characters give readers an exhilarating sense of Argentine culture in the making. 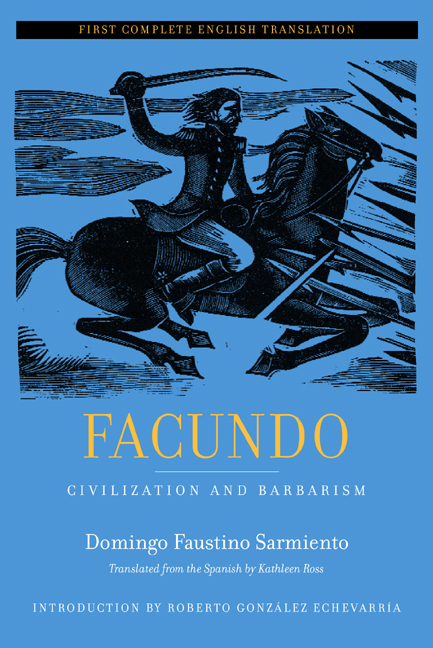 Kathleen Ross’s translation renders Sarmiento’s passionate prose into English with all its richness intact, allowing the English-language reader the full experience of Facundo’s intensity and historical reach.